No, this isn’t the first good-to-go version of Minesweeper: this baby is for making beautiful music with. The Tenori-on is an electronic musical instrument designed and created by the Japanese artist Toshio Iwai and Yu Nishibori of the Music and Human Interface Group at the Yamaha Center for Advanced Sound Technology. 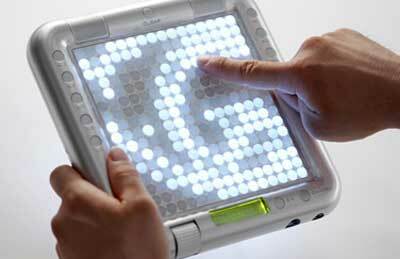 It consists of a hand-held screen in which a sixteen-by-sixteen grid of LED switches are held within a magnesium plastic frame. Any of these switches may be activated in a number of different ways to create sounds. Two built-in speakers are located on the top of frame, as well as a dial and buttons that control the type of sound and beats per minute v produced. There are two versions of the device available. The original TNR-W (Tenori-On White) features a magnesium frame, 256 rear panel LEDs and can run on batteries whilst the more affordable TNR-O (Tenori-On Orange) features a white plastic frame, has no rear LEDs and does not take batteries. The modes and sound sets in these instruments are the same. Both devices have an LCD screen on the bottom edge of the frame. Using the connection function, it is possible to play a synchronized session, or to send and receive songs between two of the devices. "In days gone by, a musical instrument had to have a beauty, of shape as well as of sound, and had to fit the player almost organically. [...] Modern electronic instruments don't have this inevitable relationship between the shape, the sound, and the player. What I have done is to try to bring back these [...] elements and build them in to a true musical instrument for the digital age."